We would all love for our pets to stay young forever, but unfortunately that is not possible. Although aging is inevitable there are some things you can do to keep them healthier. Bone and joint pain are part of the aging process for dogs and humans alike. Read up on some ways to help prevent or slow down the onset of arthritis and other joint and bone issues for your beloved pet. There are two major categories of joint problems, developmental and degenerative problems. With developmental problems, you have things like hip or elbow dysplasia, where the joint does not develop correctly in a number of different ways. Degenerative problems are commonly caused by factors such age, weight or stress on joints. With degenerative joint issues owners commonly notice that their dogs are doing less or having more difficulty with common activities. Such as getting up on the couch, going up the stairs, or getting in the back of the car. These can all be warning signs that your pet may be experiencing joint and bone pain. It is vital that you provide your dog with warm, soft bedding as the purpose of a dog bed is to keep a dog from feeling direct pressure from the floor. It is especially important to provide your dog with a comfortable bed if they suffer from joint and bone disorders like arthritis. As exposure to cold drafts, or hard surfaces can aggravate your pets existing joint conditions. 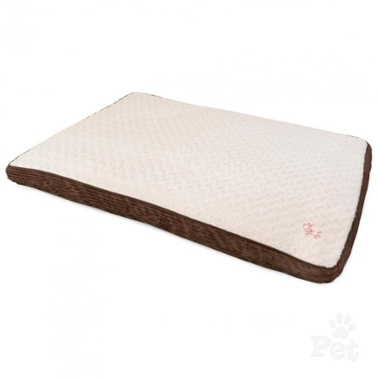 A good option for a dog suffering from joint issues is a quality memory foam bed like the Yours Droolly Indoor Osteo Dog Bed that has a high quality memory foam inner that provides extra support to your dogs joints and bones. After all it is important to give them the comfort and support they need. If you are unsure if a bed is suitable for your pet a good way to test it is to kneel on the bed on your knees or lean on your elbows if you can feel the floor, so will your dog so it is not a suitable bed. If you’re buying a puppy, especially if you’re buying a purebred puppy, do your research first to find out the health problems that the breed is predisposed to. As some large breeds such as German Shepherds, Great Danes, Rottweilers and Labradors are predisposed to joint issues and conditions such as hip dysplasia or conditions like osteoarthritis. While some toy and small dogs are susceptible to rheumatoid arthritis. So it is best to be in the know about these possible issues so that you can check out that specific dog’s breeding and heritage. As many joint conditions have some hereditary component. A good breeder will have all that information and test results such as hip scores to prove the parents health. Many will volunteer it. But you certainly have the right to ask. And you should ask, especially if you’re interested in one of the larger breeds that are already associated with joint problems. If you are interested in making a large breed, purebred dog part of your family, please take the time to research potential breeds and breeders. Dogs NZ or The NZ Kennel Club is a good place to start. It has good information on its website that can help you choose the right purebred dog for your family and find a reputable breeder that adheres to its Code of Ethics and Code of Practice. One of the best preventative measures to protect your pets joints is to keep your dog at a healthy weight; overweight dogs can develop joint problems and a dog’s bones, joints, muscles and associated tendons and ligaments all work together to give him smooth and efficient movement. By maintaining your pet’s ideal weight you are taking a step in the right direction to reducing joint pain and promoting better joint health. Feed your pet a high-protein, low-carbohydrate diet such as a grain-free kibble or raw diet. And also avoid foods and treats that contain high-carbohydrate fillers such as corn, wheat, rice and soy that are usually high in calories, promote joint inflammation and contribute to weight gain. Dogs with arthritis or joint issues should be kept warm and dry, as cold conditions can aggravate their symptoms and bring on more pain. So alongside quality soft bedding, make sure that they have good access to where they need to go to cut down on their need to climb and jump up. For example if your pet sleeps on your bed provide them with stairs to ensure they do not hurt themselves jumping up or down, which is a common injury for small dogs. Also if your home has hardwood floors, ensure your dog will not slip by putting down rugs or runners through the main thoroughfares of your home. Exercise is essential for your dog to maintain healthy bones and joints. Your pet needs daily doses of good and long exercise because a sedentary lifestyle doesn’t only cause obesity, but also atrophied joints. Similar to a Goldilocks situation, there is a sweet spot with exercise for dogs. Too much exercise puts extra strain on joints and bones. Too little leads to joints and bones wasting away. So you want to give your dog just the right amount. For most dogs, that means playtime once a day, and at least one good long walk once a day, but of course this varies from breed to breed. But as a rule by keeping your dog active you will help to strengthen your dog’s muscles – and those muscles can help stabilise and support joints. In contrast, you should avoid too much exercise during the puppy phase when your dog's bones and joints are still growing. Climbing stairs, jumping up high or walks lasting several hours still put too much strain on the joints and can encourage the later onset of disorders. You should opt for short walks on grass and dirt tracks for your walks, since they protect the joints more than hard concrete surfaces. Although exercise is extremely important you also need to think about the type of exercise you give your pet. For example repetitive and abrupt games like playing fetch can lead to injuries especially if you have not warmed up your pet's muscles before. Also running on concrete or hard ground can be very hard on your pet's joints especially if they are a puppy, elderly or overweight. The best type of low impact exercise is swimming! Not only is it great in summer to cool your dog down it also provides both muscle strengthening and a good cardiovascular workout. But always remember, if you’re worried about your dog getting more exercise than is beneficial, your veterinarian will be happy to advise you a sensible canine exercise regime. One of the main causes of joint and bone pain in pets is trauma or past injuries. As joint and bones can deteriorate as a result of stress or trauma caused by an accident. This can occur from accidents or trauma that damages your dog’s bones, tissues, and ligaments, or high-demand activities that repeatedly stress their joints. These post-traumatic or repetitive motion injuries can cause damage to the joints and make them wear out more quickly. So it is important to limit high demand activities such as agility or running long distances on the road, especially until your dog is fully grown as to not cause any damage to their joints. The stage at which your dog is fully grown varies depending on the breed and size, so it is important to check with your vet before undertaking any strenuous activities. What you feed your dog can have a big impact on their joint health and arthritis pain. Providing them a high-quality diet designed to promote bone and joint well-being should be your priority. There are additives and supplements to look for in your dog’s food that helps support this type of diet such as fish oil, omega 3, omega 6, chondroitin and glucosamine. 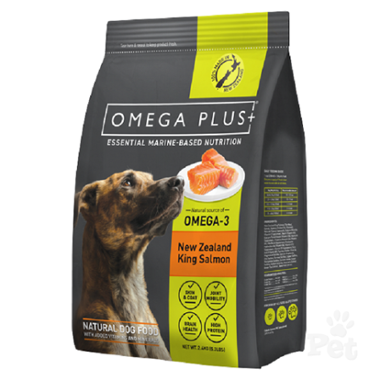 A good example of a food that supports joint health is Omega Plus King Salmon Dog Food. This food is 100% NZ made using King salmon as the number one ingredient. This makes it beneficial for your dogs joint and bone health as king salmon oil naturally boasts high levels of omega-3 and omega-6 which have a range of health benefits for your dog, including healthy skin and coat, brain maintenance, heart and intestine health, joint mobility and dental health. As well as fish oil's natural anti-inflammatory benefits which are helpful in keeping their joints healthy and pain free. Proper hydration is needed to keep the joints adequately lubricated and allows them to move and flex as the body demands. Dehydration can lead to stiff tendons and ligaments which might increase the chances of injury. It is vital that you make sure that your dog has an ample supply of fresh, cool water in a convenient location and that you refill and refresh the water bowl several times each day. This is especially important in extreme temperatures or when they are exerting themselves a lot in activities such as running or dog sports. You do not have to wait to see signs of joint and bone pain to start feeding your pet supplements. It is a good idea to put in place precautionary measures by starting your dog on a quality glucosamine or chondroitin supplement prior to any injury or wear and tear. After all a little prevention can go a long way in protecting your pets joints and bones. If your dog is already showing signs of joint pain or arthritis, there are a number of natural supplements that you can try before resorting to medications. 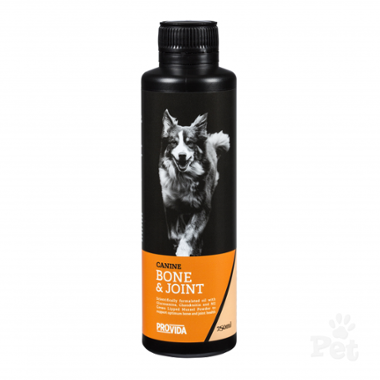 A good option is a specially formulated supplement blend such as ProVida Bone & Joint which is a blend of flaxseed oil, glucosamine, omega 3, chondroitin, vitamins and green lipped mussel powder. This is an highly effective blend as omega-3 fatty acids have demonstrated benefits to joint health. And the inclusion of green lipped mussel powder is helpful as it is a natural source of mitochondrion and omega 3's, and plenty more nutrients as well – like antioxidants, vitamins, minerals, and enzymes your dog’s body needs. Arthritis is a general term for abnormal changes in a joint. These changes occur when cartilage is worn away faster than it can be replaced. Your dogs cartilage acts as a cushion to protect their bones, so when it wears away, joints become swollen and painful. Common warning signs of canine arthritis include stiffness when getting up or lying down, limping, slowing down on walks, pain after exercise, or reluctance to jump or climb steps. If you suspect your dog may have arthritis or joint pain make sure you consult your veterinarian if you notice any of these signs. It’s important to recognise the signs early so you can begin treatment in ensure you can slow the progression and help preserve your dog’s quality of life. Although bone and joint problems are common in dogs of all sizes and breeds. It is not inevitable, and many steps can be taken by dog owners to avoid or minimise the effects on their dogs. These include prompt, medical treatment for injuries and conditions, keeping your dog a health weight, and well exercised, and feeding your dog a quality diet with joint supplements. After all a little prevention goes a long way in terms of keeping your dog healthy and happy for a long as possible so you can both enjoy each other's company well into your dog's senior years.